Bo Nickal — Penn State senior and 2019 NCAA Division I wrestling champ at 197 pounds — has been named the 2019 InterMat Wrestler of the Year, the amateur wrestling website announced on Monday. Presented each year since 2006 to the best collegiate wrestler in all divisions, the award is based exclusively on the balloting of writers at InterMat. Each staff member is asked to select five wrestlers and rank them from first to fifth. Point values are assigned to each placement, ranging from one point to a wrestler listed fifth on a voter’s ballot, up to nine points for a first-place vote. Nickal received five of the 10 first-place ballots for a total of 80 votes. Jason Nolf — Penn State teammate at 157 pounds and fellow three-time NCAA champ — found himself at the top of three InterMat staffers’ ballots, for a total of 72 votes. Cornell’s Yianni Diakomihalis — 141-pound champ — was named on the two remaining first-place ballots, receiving a total of 50 votes. 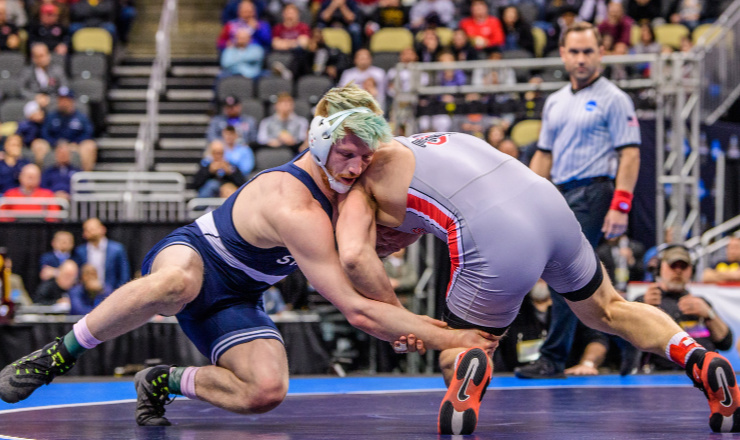 By winning the 197-pound title at the 2019 NCAA Division I Wrestling Championships in Pittsburgh, Bo Nickal put himself in rare company even among Penn State mat greats. The Texas native won his third national crown, joining fellow Penn State three-time champs Ed Ruth, Zain Retherford, and Jason Nolf. What’s more, it was Nickal’s fourth NCAA finals appearance (having placed second at 174 at the 2016 NCAAs before winning three consecutive titles — the first two at 184 in 2017 and 2018 — joining David Taylor as a four-time finalist. If that weren’t enough, Nickal becomes the fourth Nittany Lion wrestler to have been named InterMat Wrestler of the Year, joining Zain Retherford (three-time honoree, 2016-18), David Taylor (2014), and Ed Ruth (2012). Bo Nickal concluded his stellar career at Penn State in outstanding fashion. He compiled a 30-0 record in 2018-19, with 18 pins, 3 technical falls, and 6 major-decision victories. Among his senior-year accomplishments: 2019 Southern Scuffle champ, and the Big Ten title. At the 2019 NCAAs in Pittsburgh, Nickal managed to score three falls and a major decision on his way to winning the 197-pound championship with a 10-3 win over Ohio State’s Kollin Moore in the last match of the evening during the Saturday night finals. Nickal finished his career with the Nittany Lions with a 135-5 overall record, for a 96.43 percent winning percentage. Prior to arriving at Penn State, Nickal was a three-time Texas state champ for Allen High School in suburban Dallas.